2015- Portrait show, Arts Club of Washington, D.C.
2014- National Association of Women Artists Gallery, N.Y., N.Y.
2014- NOBO Gallery, Hudson, N.Y.
2014- 3 Person show, Riverside Library, N.Y.,N.Y. 2014- Kiersted House Gallery, Saugerties, N.Y.
2014- Ev(e)olution IV, Riverside Library, N.Y, N.Y.
2013- Solo show, Recent Paintings, EONTA Space, Jersey City, N.J.
2013- WAAM @NAWA, National Association of Women Artists Gallery, N.Y., N.Y.
2013- Morphogenesis, 310 ART Gallery, Asheville, N.C.
2013- Ev(e)olution III, Riverside Library, N.Y., N.Y.
2012 - Solo show, Aish Center Gallery, N.Y., N.Y.
2012- Ev(e)olution II, Riverside Library, N.Y., N.Y.
2011 - National Association of Women Artists Gallery, N.Y., N.Y.
2011 - Solo show, Saugerties Library Gallery, Saugerties, N.Y.
2010 - Bearsville Print Studio Gallery, Woodstock, N.Y.
2009 - Solo show, Barnes & Noble, Kingston, N.Y.
2009 - Art of the Memoir, Kleinert James Gallery, Woodstock, N.Y.
2008 - Solo show, Millard Building Studios, Kingston, N.Y.
2007 - 3 person show, Woodstock Artists Association and Museum, Woodstock, N.Y.
Istar Schwager's work is in many private collections. Her collage "Leaves are Falling" was featured on the cover of the October, 2012 issue of the American Psychologist, sent to the 150,000 members of the American Psychological Association. 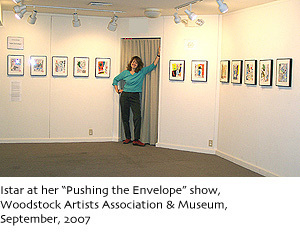 She is an exhibiting (active) member of the Woodstock Artists Association and the National Association of Women Artists, an over 120 year-old organization whose members have included Mary Cassatt, Louise Nevelson and Alice Neel. As the President of Creative Parents, Inc. and the founder of creativeparents.com, Istar Schwager, Ph.D. has worked with Sesame Workshop, Nickelodeon, HighlightsParents.com and other companies developing innovative programs and projects. Doesn't everyone want to be an artist when they're young? Unfortunately, a lot of kids fall by the wayside because they're told their very imaginative work isn't good. I kept the spirit alive because I was encouraged by a number of teachers who appreciated my second grader attention to detail and ability to draw realistically. I doodled my way through every school notebook, often forgetting to listen or take notes. I took lots of art classes but was a very rebellious student. Art was the place for me to do my own thing, not "theirs." I earned a B.A. from Barnard in Art History, and took as many fine arts courses as allowed at Columbia. During college I sold William hippo replicas in the store at the Metropolitan Museum and after college worked as membership secretary at the Guggenheim Museum. It was an exciting time in the art world. At the Art Students' League I studied abstract painting with Larry Poons and Theodoros Stamos, was a sometime member of The Art Workers Coalition, and studied with Jacob Lawrence at Parsons. I also took classes at the School of Visual Arts and studied with Ralph Humphrey, Robert Swain, George Hoffman and others in Hunter College's Graduate Arts Program. My work over the years has been primarily with media companies, developing TV programs, games, and online sites for kids and parents. After working briefly as a teacher I earned a Ph.D. to become an educational psychologist. I was on staff at Sesame Workshop (then CTW) and have been a consultant with them as well as Noggin, Nickelodeon, Scholastic, Highlights and others. My visual arts background has proved a great resource, and is continuously applicable. Having a creative background, I always identify with the artists and writers I work with whether I'm hired as a writer or advisor. A few years ago I created a website, CreativeParents.com "for parents leading creative lives." About 15 years ago I was feeling overwhelmed juggling family with work deadlines. What I realized I wanted (needed) was time just doing artwork. I couldn't do that, but did return to studying art with Peter Schroth, Enid Braun and others at the 92nd Street Y and with Pia Alexander at the Woodstock School of Art. Since then I've kept up the momentum by creating new visual and conceptual challenges. My collage work over the last several years is inspired by the cut- paper works of Matisse, by collage artist Anne Ryan, designer Josef Frank, and painter Stuart Davis, among others. My work has been seen in juried shows at WAAM, the Arts Upstairs in Phoenicia, the Saugerties Artists Studio Tour including annual exhibits at Opus 40 Gallery in Saugerties, N.Y., and in a number of private collections. Schwager has explored a number of different mediums, but is currently creating cut-paper collage. When asked about her choice, she explained "the two elements that I work with most are color and form. I love relationships of shapes in space. Collage provides the opportunity to transform materials that we would otherwise overlook or discard, by putting them into a different context. I look at everything from brochures to envelopes to fabric scraps for their potential in an art piece." Her work with children also provides inspiration. "My art work gives me the opportunity to express a more playful side of my character and I think that kids are enormously creative." When not creating collages, Schwager works as an educational psychologist, consulting with media companies and children's programming, magazines and websites. In spite of her full plate, art always has a place in her life. 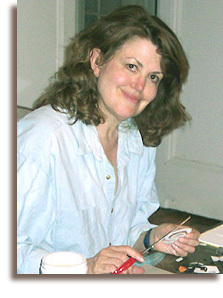 "I took a course with Pia Alexander at the Woodstock School of the Arts, and that ...got me even more interested in doing collage and gave me a sense of the wonderful flexibility of being able to try things out and move them around and see how different shapes and colors work together... I found that enormously freeing and energizing." Schwager counts Matisse as a an influence, particularly a recent exhibit of his textiles at the Metropolitan Museum of Art. "I've always loved his work," she said, "and I particularly loved his last work with collage and cut paper. His work is very colorful, very design-oriented."